Despite the title of this piece (sorry, couldn’t help it), Electional astrology isn’t actually about elections. It’s a means of predicting the outcome of a choice (as in when one ‘elects’ to do something) like when to start a business, get married or some similar big thing. In this case, Prime Minister Theresa May ‘elected’ (chose) to hold a General Election on Thursday, June 8th. So we have the date: the time is for when the polls open at 7.00 am BST; the place is the Palace of Westminster as that is the seat of government. It could be a generic ‘London’ but let’s be as accurate as possible about this. Below is the chart for this particular event. Further down we look at it in some detail. First, the Ascendant is in Cancer so, as the Moon rules Cancer, it follows that the chart ruler is the Moon. As the Ascendant and 1st House are indicative of the country as a whole, and the Moon denotes the general population, this looks as if The People regard this as an important event. No, make that seriously important. It may be that, as in last year’s referendum, people don’t show up as they don’t think they will make a difference but given the Moon’s chart rulership I don’t think this is likely. The Moon, by virtue of its rulership of the 4th House, also denotes the Opposition in government. The Moon’s placement in this chart and its rulership of the chart gives me to think that the Opposition is in with a much better chance than the normal indicators would suggest. The Moon is in Sagittarius (knowledge, long-distance travel, justice, philosophy) in the 5th House of creation and recreation. It is making a separating opposition to Mercury (information, communication, short-range travel) in the 11th House (Parliament, especially the Commons, groups and societies in general). In general terms I think that this indicates that the population has stopped listening to slogans, sound-bites and political rhetoric out of Westminster and its inhabitants and wants to know just what is going on. A Sagittarian will go to the ends of the Earth, if necessary, to find out what he wants; this population, especially the younger end, is almost certainly looking beyond the usual stuff and will make up its own mind. The Sun represents the Prime Minister, monarch, aristocracy, magistrates, judges and all persons in authority and of distinction. In this case we’ll just stick with the PM. The Sun is in Gemini (see Mercury, above); technically this should be good for getting her message across but Gemini tends either to have a short attention span or works in slogans and sound bites, all rather repetitive. Given the above remarks about the Moon, this probably isn’t going to work very well. On top of that, the Sun’s placement in the 12th House is really, really not helpful, as one of the descriptions for this House is, ‘the House of self-undoing’. It’s also representative of hospitals, charitable institutions, old peoples’ homes and the welfare state. All things that are under serious scrutiny anyway. While the Prime Minister has appeared in public under carefully controlled conditions, for the purposes of this chart (and the Election) she has basically hidden herself away until it’s all over. By the time the polls close the Moon will be making an applying opposition to the Sun; I’m looking at this as my first indicator that there will be a new Parliament. The Sun makes a trine aspect to retrograde Jupiter (knowledge, long-distance travel, justice, philosophy) in Libra (balance, fairness, the arts, diplomacy) in the 4th House (land, its workers, the population, the Opposition in government). In mundane astrology Jupiter also rules the nation’s wealth and retrograde in this placement that isn’t as good as it could be right now. 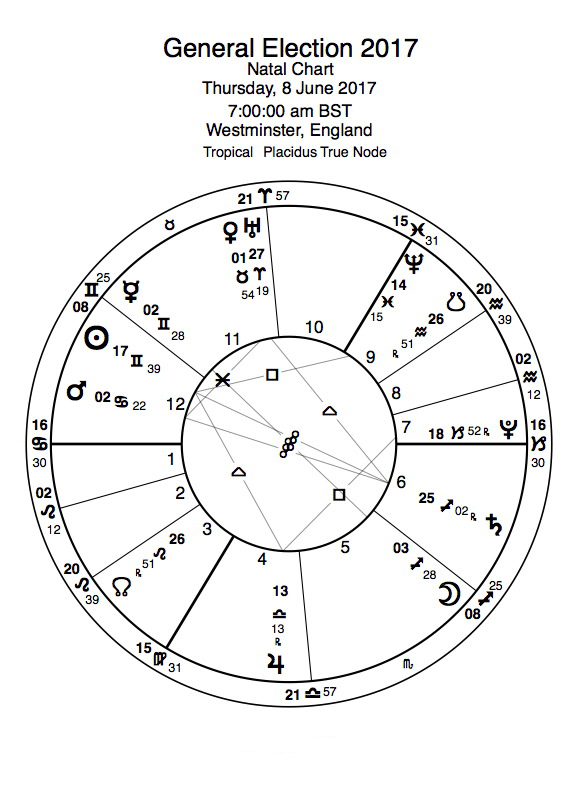 Jupiter’s applying square to Pluto (transformation, big finance,) in Capricorn (government, trade) in 7th House (foreign affairs, relations with other countries) is pretty much indicative of what this election is about; Brexit. It also shows that whatever the PM says, it’s not going to be easy. 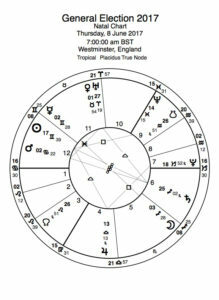 Also significant is the Sun’s square to Neptune (socialism and left-wing political ideas generally) in Pisces (compassion, indecision, impracticality) in the 9th House (long-distance communication and travel, religion, churches, law courts) but also in close conjunction to the Midheaven, also in Pisces. The Neptune-Midheaven conjunction is also trine to the Ascendant and, given Neptune’s tendency towards smoke and mirrors, may show that early indicators during the day, as well as previous opinion polls, won’t necessarily be any kind of accurate guide to the eventual outcome. That may also apply to the exit polls but I think it doubtful. It mainly applies to the apparent vagueness of statements made by politicians of any party and also to the machinations of anyone—the press, social media, blokes down the pub—trying to affect the outcome of the election. Saturn (land-owners, the elderly, epidemics, among other things) is retrograde and in opposition to the Sun in Sagittarius in 6th House (public health, armed forces and police as public servants, civil service). Saturn generally likes things to be seen to be done properly and, in this case, in 6th House is going to be seriously interested in the NHS in particular, although the armed forces, the police, their cutbacks and what should be done about them are also matters of ongoing public concern. As well as that aspect, Saturn is also in opposition to Mars (the military, terrorist attacks, conflicts generally) in Cancer (the Opposition, the population, democracy) in 12th House and trine to Uranus (right-wing politics, individualism, political tension) in Aries (the country as a whole) in 11th House. Saturn and Mars are regarded as malefics (in other words, really not good) while Uranus is the planet of revelation, revolution and sudden change (aka chaos). While this could add up to a lot of trouble, I don’t think that’s likely. Uranus is also conjunct Venus (women, arts, peace and diplomatic solutions) in her rulership, Taurus, (pretty much the same as Venus) in 11th House while Venus is also sextile to Mars. That little combination is likely to soften any revolutionary leanings into a peaceful and practical way of changing things. That’s my second indicator that we’re going to see a change. Having dealt with everything else, we’re left with Mercury. In this case, Mercury represents the popular press and social media. It is in Gemini, which it rules, so it’s quite at home and in the 11th House (see above) which puts it firmly in the driving seat as far as news from Parliament and politicians goes. 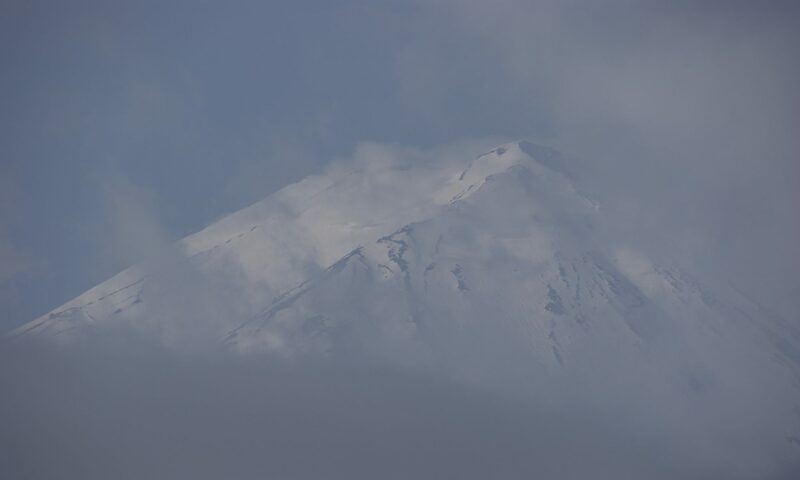 However, that opposition from the Moon means that the population isn’t necessarily listening to what is being said or, more likely, is looking for answers that don’t come from newspapers and will scour the internet, among other sources, in order to inform its opinion as to what should be done and which way to vote. In my opinion, the Prime Minister has essentially shot herself in the foot by choosing this date. I think we’ll see a change in Parliament; whether the current Opposition party is invited to form a government or there has to be some sort of coalition remains to be seen but I’m inclined towards the former. I am also of the opinion that even if the current government is returned there may be a new Prime Minister in the near future. The thing is that astrology, as Maggy and I always say, is what happens when you don’t use your free will. The chart above shows the trend of this election and its likely outcome; what actually happens tomorrow will depend on a large enough body of people exercising their free will, as well as their democratic right, in order to effect the change(s) they want to see. No general election is ever designed to be a fait accompli; what makes it so is apathy on the part of those who can’t be bothered or think that they won’t or don’t make a difference. I do; you do; we all do. Free will rules, not astrology. All you pure-bred, Right-thinking (that capital letter is deliberate), Britain First, UKIP-voting pure-bred English, think about this. A very early part of our cultural heritage was from the Celts. They came from Asia, via Europe. Another large chunk came from the Romans. Central heating, glass in windows, part of the basis for our language. They came from Europe. And they were responsible for naming this collection of islands ‘Britannia’. That’s the Latin root of ‘Britain’. Then there were the Angles and Saxons, the first of whom actually gave this country its name. As in England. And some more of our language. Basically, the German-based bits. They came from Northern Europe. Then there were the Vikings. More culture. More language (the east side of England has a lot of Scandinavian in the place-names). Then came the Normans. Not only did they update our culture, they actually brought along ownership of some choice lands in what is now France. They were responsible for the Romantic (meaning ‘from Rome’, not ‘soppy’) bits of the language. They came from Europe. OK, so they were all invaders. Over time, though, things settled down and we haven’t been successfully invaded since. But this country has generally been open to letting some in. Like the Huguenots from France, fleeing religious persecution. Or they were imported, like the flax-weavers from Flanders. Or the basis for the present Afro-Caribbean communities who came over in the 1950s and ’60s. We’ve always been very closely involved with Europe. We even imported two kings—George I from Germany, William III and Mary II (aka ‘William and Mary’) from The Netherlands. Celtic, Northern European, Scandinavian, Latin, Norman French. And that’s just a thousand years’ worth. Followed up with whoever moved here and stayed and married one of your ancestors and added another strand of DNA into your family. Who’s to say YOU haven’t got a little bit of African, Asian or, dare I say it, Middle Eastern blood in your ancestry? So all you people who are proud to tick the ‘White British’ box are proudly declaring that you are one of the most mongrel-bred people in the world. ‘Cos that’s what we all are. They Call Me Mr. Lion. But you can call me Lion. Most people do. I have no idea what sort of thing I’ll be posting but expect astrology, cars, NASCAR and things like that. And the odd rant. I don’t do politically correct language. I try to make sure that everything has correct spelling and is grammatically sound, except when I’m making a point. Everything on here is only my opinion but as far as possible it will be factually correct. If something isn’t (and I’ve remembered to allow comments) please let me know. However, if you tell me I’m wrong because of what you heard from a bloke down the pub, please be warned that I will require evidence and/or proof of your claim before I make any changes. Just for a little background, I started work as a tyre fitter. I then sold advertisement space on the local newspaper (the Stroud News & Journal), before moving on to do the same thing for a magazine called Safer Motoring which changed its name to VW Motoring. While I was there I changed hats, from Advertisement Manager to Sub Editor, which meant a drop in salary but rather more job satisfaction. It also got me noticed to the extent that I made another move, this time to VolksWorld magazine. 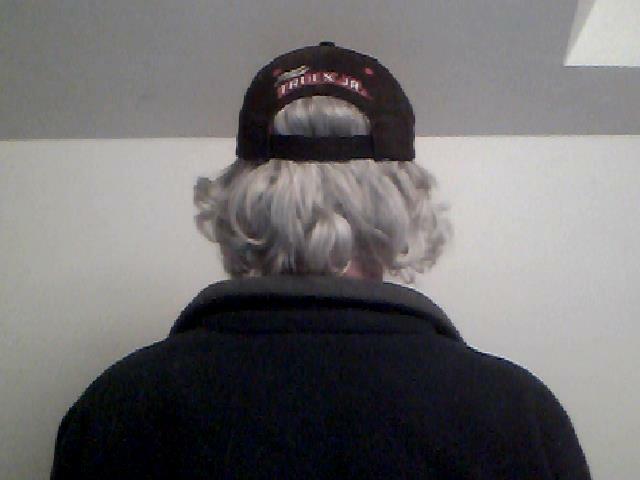 But things changed and I moved on to Trucking International. They needed an editor and I needed a job closer to home but it didn’t work out well. So that stopped. Unemployment followed for a little while, living (hah!) on benefits while doing odd jobs to keep my hands and head occupied. I tried doing freelance work but that didn’t work out too well, either. … before I landed a job racing ’round the South-East of England delivering alarm systems, domestic and industrial, and the parts thereof. I have been White Van Man (choices were either a Ford Transit or a Vauxhall Cavalier, both diesel) and survived! Six months of that and I got a call to go back to magazines, this time Prediction, sadly now defunct. That developed my interest in astrology, along with other subjects of an esoteric nature, and I stayed there until an enterprising woman decided that I was an ideal candidate for a job on a website for women, doing the astrology an’ stuff. Well, maybe, but the website didn’t last long because the funding ran out. With the demise of that, I married the boss and we set up a book publishing company. That pretty much brings me up to date. So now, as it says on the About page, I’m a bloke behind a number of computers who is currently re-learning how to build websites. That’s as well as keeping up with what goes wrong on our Land Rover Discovery, whichever computer is misbehaving (currently one dead Mac G5 and one overheating ditto) and getting round to fixing divers and sundry gadgets.